Want to learn more about the story behind our craft spirits? Looking for new cocktail recipe ideas? Enjoy reading about craft spirits? Then check out the CopperMuse® Blog, home of craft inspired musings. Welcome to the March 2019 edition of the CopperMuse Distillery newsletter. Click here to read all the details. As the new year has gotten underway, I’ve been making an active effort to return to simplicity. It’s so easy to get caught up in all of the things I want to do and accomplish and all of the ways I want to make changes. Instead of letting myself get overwhelmed, I’m trying to keep an uncluttered mind and do simple things that bring me joy. Books have been written about the therapeutic side effects of taking the time to brew a simple cup of tea, and making a hot toddy follows the same basic principles. 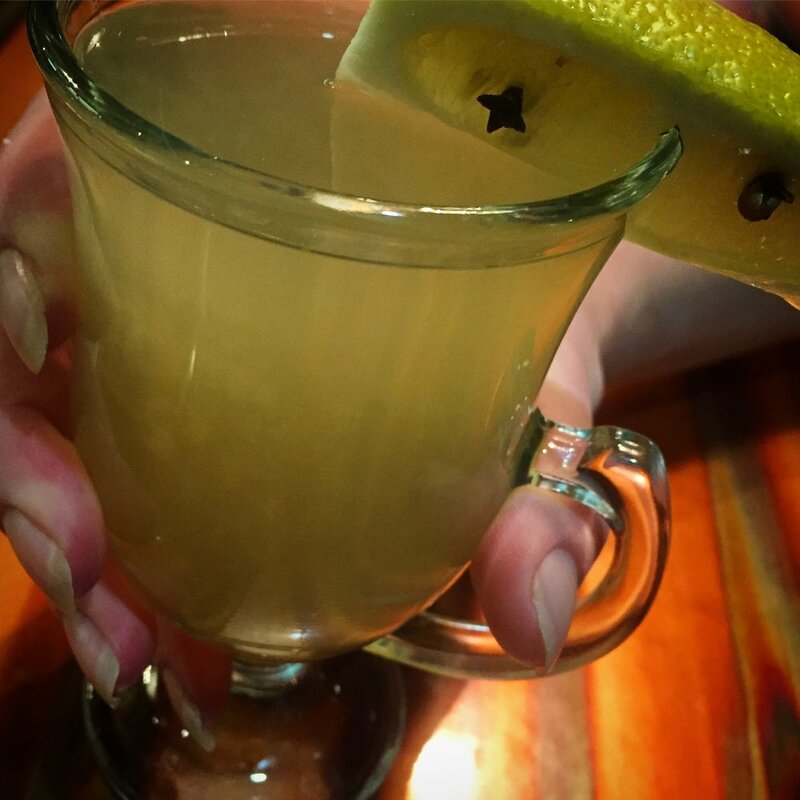 A combination of hot water, lemon, honey, and whiskey (or bourbon, or rum, or...whatever you fancy) this drink is straightforward and soothing. There are many differing opinions on the best ratios to use, but the basic ingredients are usually the same. Coming inside from the cold after a long day of work, it’s easy to put the kettle on, wait for the whistle, and easily make a soothing and warming beverage. 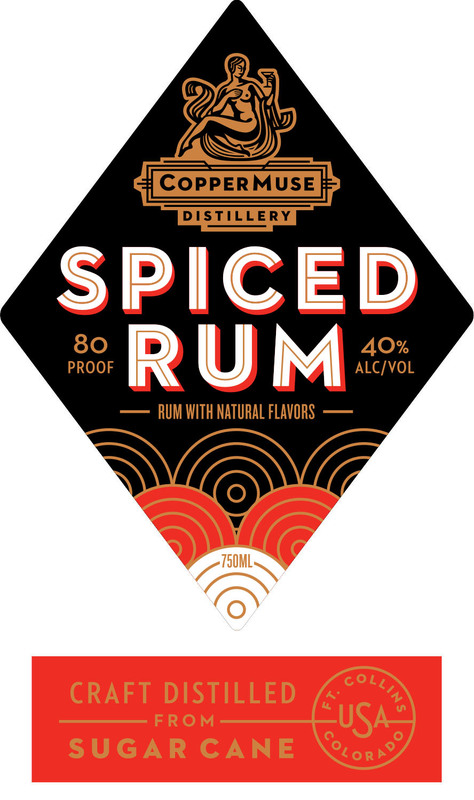 Using a liquor that has spicy notes makes for an even tastier and more interesting toddy, and CopperMuse’s spiced rum is a perfect option. It smells like my great aunt’s gingerbread, but tastes like so much more; the flavor is a well-rounded balance of citrus and spice with a gently sweet finish. As I’ve used it more and more, I’ve found that my at-home toddies don’t need honey because the rum’s sweetness is perfect on its own. Our award-winning Gold Rum is infused with nutmeg, cinnamon, grains of paradise, cloves, vanilla and blood orange zest. 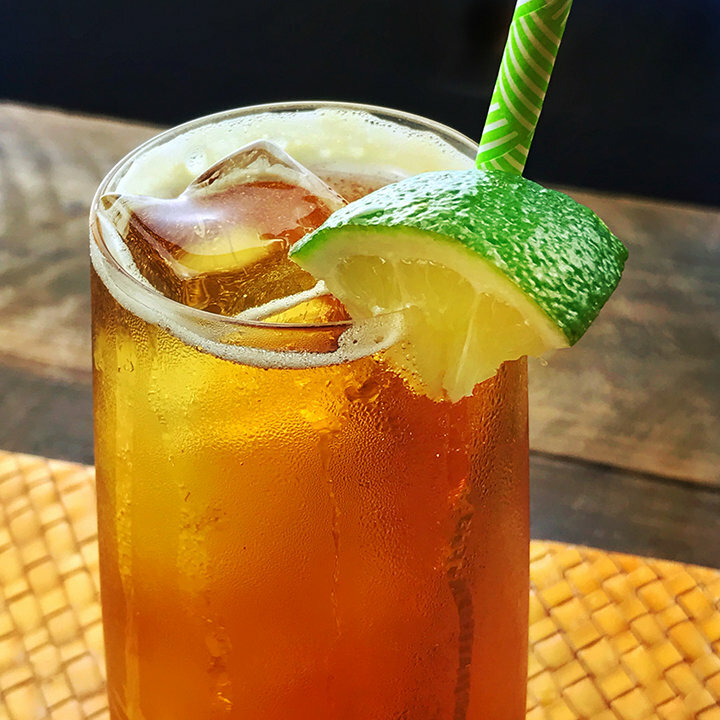 Spiced rum also pairs extremely well with ginger (which is spicy and sweet in its own right), and mixing this new CopperMuse rum with ginger beer and lime is fantastic if you’re a Moscow mule fan willing to branch out a bit. Both toddies and mules are simple drinks that really allow the individual ingredients to shine, while also creating beautifully cohesive finished flavors. They don’t require super fancy mixings, and they’re easy for everyone to make at home. Though the winter has been mild so far in Colorado, we all know we’re going to get the snow and cold sooner or later. Along with your cozy coat, warm boots, and firewood, it’s a great idea to have a bottle of CopperMuse Spiced Rum at the ready. You won’t regret it! Get a 750 mL bottle for yourself at the distillery, and while you’re there, try some of the innovatively delicious offerings on the winter drink menu; you won’t regret that either! Give a gift basket they will truly enjoy! The general trouble with gift baskets is that they can be really hit or miss. Maybe you don’t need more sweet or salty snacks, or you will never in your life eat that jar of orange marmalade or sausage log. What if the whole basket is filled with white chocolate (which is lying about being chocolate)? No thank you. With the abundance of cakes and cookies and other edible treats this time of year, it’s nice to have a different kind of gift basket, one with a built-in activity, and even better, with fine alcohol! For a basket unlike so many of the others out there, look no further than CopperMuse’s creative offerings. There are three unique themes to choose from, each filled with makings and mixings for some fantastic cocktails. With included recipe cards as well as appropriate drinkware, your giftee will have both the materials and the instructional know-how to make cocktails on her or his own (or maybe even with you). The Bloody Mary Basket is perfect for those who love a superbly stocked DIY Bloody Mary bar. You can choose one large bottle of Vertueux Vodka, or two smaller bottles of infused vodka in flavors that complement and enhance one another (jalapeno, horseradish, or bacon). There’s also a laundry list of fantastic other ingredients included, from a zesty base Bloody Mary Mix to spices and sauces and garnishes to make show stopping drinks. If you’re more in the market for a well-crafted, shaken-not-stirred beverage, the Martini Basket is where to go. Not only does this basket have the Vertueux Vodka and assorted olives that make a great martini, you will also get all the tools you need to mix the perfect drink. This basket is a great idea for someone looking to start making drinks at home, who doesn’t yet have a shaker, strainer, and mixing glass! For the ginger lover, the CopperMule Basket is an excellent gift. This basket includes ginger beer, lime juice, one (or two) beautiful solid-copper mug(s), and you can choose either CopperMuse Vertueux Vodka or Gold Rum as your alcohol. As a person whose drink of choice tends to veer to the menu option with ginger and lime, this basket is right up my alley. Not to mention, every grown-up should have a solid-copper mug or two, because you just never know when the mood for a mule will strike at home! All these options come in stylish faux leather baskets that can be repurposed and reused, so again, nothing goes to waste. 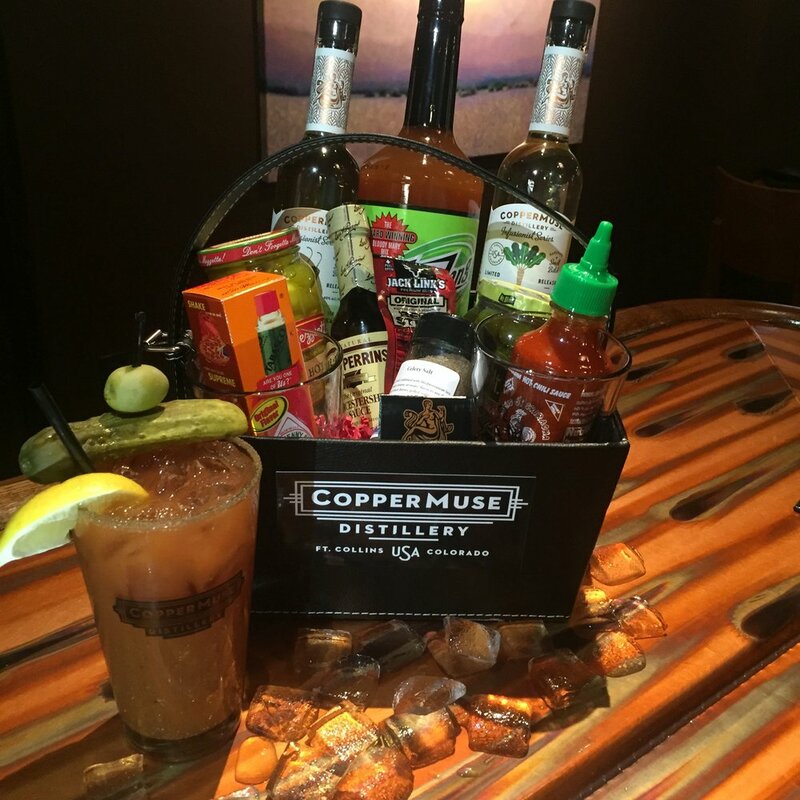 Contact CopperMuse at 970-999-6016 to ask about pick-up availability or reserve yours online here, sooner rather than later to make sure you can get the basket you want! These baskets are not available to be shipped, but can be picked up at the distillery. Don’t let this deter you though; get a basket for visitors from out of town and then you can all make drinks together! 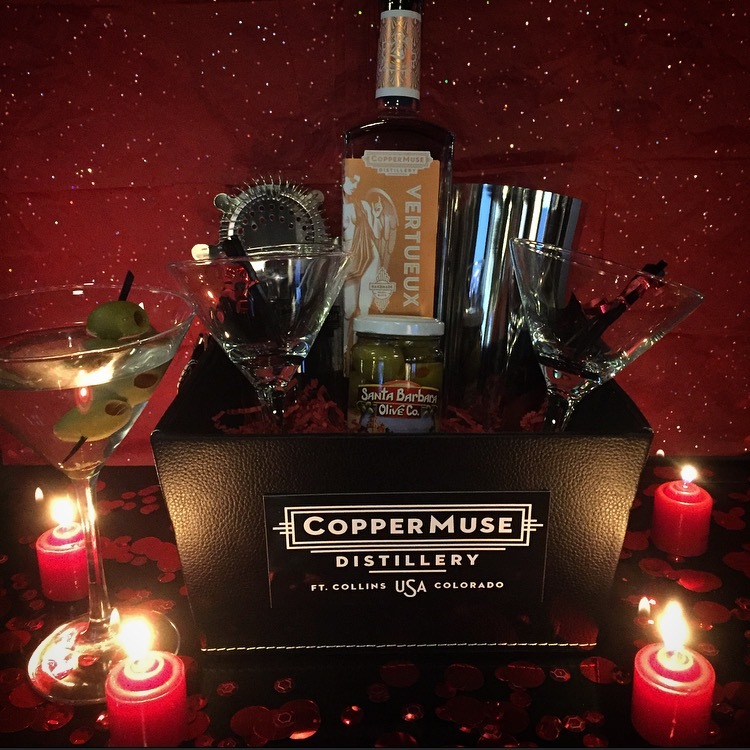 Spending good time with good people is what the holiday season is all about, and mixing up some cheer with a CopperMuse gift basket is a great way to get in the spirit of the season. Colorado State University in Fort Collins, Colorado, Collegian TV ("CTV") recorded one of our recent Bartending classes. Check it out here! We host Bartending classes monthly and can even schedule a private Bartending event for you and your friends (10-12 people required). Call us at 970-999-6016 or email us at info@coppermuse.com to find out more details. 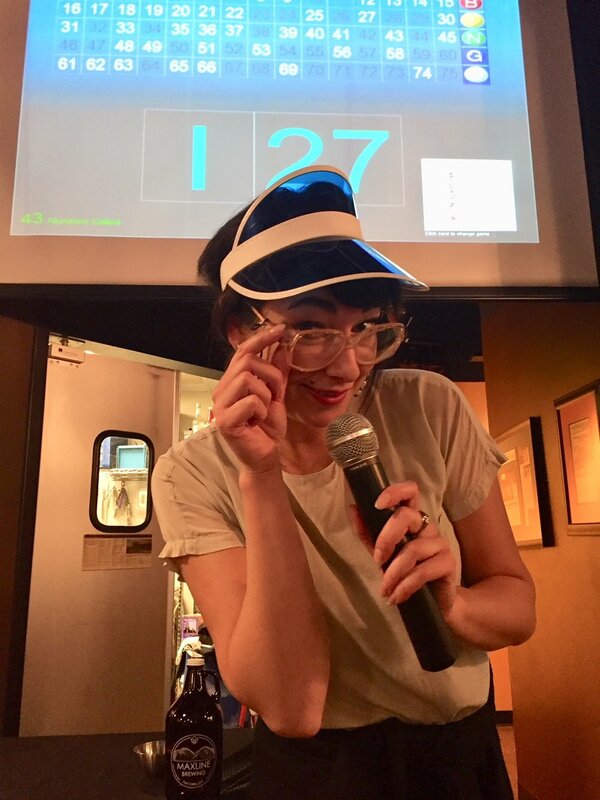 Tuesdays at CopperMuse are bingo nights, and even with a digital set-up, the best and most charming parts of the game many of us remember from our youth are still there: good-natured heckling and cheering, a cacophony of sounds and sights, and prizes galore! Everyone shares each other’s highs and commiserates in the lows in an encouraging environment, conducive to strangers becoming friends, and blowing off steam in a fast-paced but low-stress way. It’s free to play, and each participant gets two bingo cards. Pennies are used to keep track of what’s going on, and you can order drinks and food throughout playing. One of my favorite aspects is that the shapes you have to create on your cards are not always average bingo lines; sometimes you make turtles, or bobbins, or power lines. You need to pay close attention and make sure you’re following what’s happening. If you call “bingo!” and you don’t have it, you will be called out for your blunder, not in a malicious way, but in an “oh-thank-goodness-I-still-have-a-chance-to-win” way. This bingo has really great vibes. The prizes are fun, and range from cans of Spaghetti-Os (plus a shot! ), to raining money (something you should see to get a full understanding), to solid copper mule mugs, to a whole 750 mL bottle of CopperMuse spirit (excluding whiskey), and other quirky things that change from week to week. Even if you don’t win, it’s highly entertaining to see what other people snag and how they react to their loot; adults finding joy in silly prizes is priceless! Kristie, bingo caller and emcee, is classy, sassy, and absolutely hilarious. She encourages everyone, gets the crowd on the side of winners and losers alike, and makes sure everyone is hydrated and having fun. It’s a rare person who can handle such a group with the grace and humor she has, but every week she makes it a memorable and enjoyable evening. Come give it a try, get some great drinks, and say hello to the awesome Kristie, Tuesdays from 7-9 PM! Planning a birthday party for a grown-up can be hard. We don’t have a lot of good ready made options like we had when we were kids, and if you want to do something that’s fun, classy, and unique, that can be a super tall order. My lovely friend Laura recently turned thirty and we, her friends, wanted to surprise and celebrate her in style. We had done a public bartending class earlier this year with CopperMuse and had a great time, so I reached out to the team to see if we could organize another class as a private event. Everyone was receptive and enthusiastic and we got to planning. We agreed on four cocktail options, choosing some of Laura’s favorites. Peter, CopperMuse’s talented chef, made delicious plated snacks, and even had gluten and dairy free options. During the class, after we surprised Laura and there were happy tears all around, we took turns making drinks. We each made one complete drink and also tasted the liquors from each drink on the birthday menu. There was a pouring contest (with the winner receiving a free shot) as well as a short tour of the distillery. This was a time to cheer for each other unabashedly, while we all learned, made messes, and ended up with some fantastic drinks. Lauren, who taught the class, is super smart and incredibly fun, and energized the group while she taught us. She is approachable and kind, and made sure that everyone was involved and enjoying themselves. We learned bartending basics, some cocktail specifics, and overall had a fantastic evening. These classes are held when the distillery is closed, so you have the place to yourself which makes you feel like your group is getting specialized attention (because you are!). Classes are also held at regular times throughout each month, so if you don’t need a whole class to yourselves, you can join an open to the public class and meet some new people. Drinks are changed seasonally so there are always new things to learn and to try. Classes are $39 per person which is truly a steal. Not only do you make your own cocktail, try all the liquors from that class’s menu, and have tasty food, you also go home with a bottle of select CopperMuse liquor so you can start mixing drinks at home. Experiencing these classes has raised the bar on grown-up celebration, showing that you don’t always have to do the same old thing. To get to planning a party of your own, please call CopperMuse at 970-999-6016 or email info@coppermuse.com. Trying something new with friends is always exciting, and when the end result is a great cocktail, all the better! There’s much to be said about spirits when fall comes around. The ghostly kind are on everyone’s mind as Halloween approaches, and a good (spirit filled) libation with friends is always a good idea as days get shorter and nights get colder. One of the most appropriate liquors for this time of year is black vodka, which sounds and looks deliciously mysterious and kind of spooky. I then tried the Tchaikovsky, whose combination of coffee and ginger flavors meld beautifully with black vodka. The Caraway With Me features caraway-dill infused black vodka with lime and cranberry, and fantastically manages to taste like sweet toasted pumpernickel bread with a fruity twist. 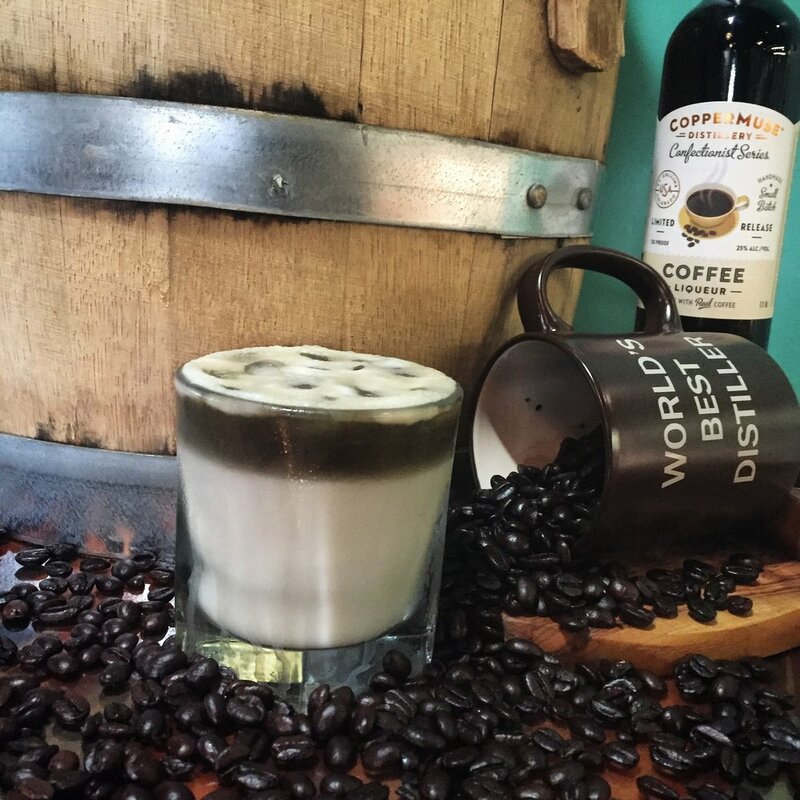 I finally settled on the White Island as my go-to CopperMuse drink; its coconut, coffee, and cream elements are topped with black vodka for a dramatic effect and comforting flavor. (The vodka floating on top gives the White Island its name.) All of these drinks, as well as the other black vodka creations on the menu, have balanced flavor profiles as well as strong visual impact. These are drinks to be savored with both your eyes and your taste buds. There really is nothing like a well made drink in good company as summer has given way to autumn and we settle in for winter. 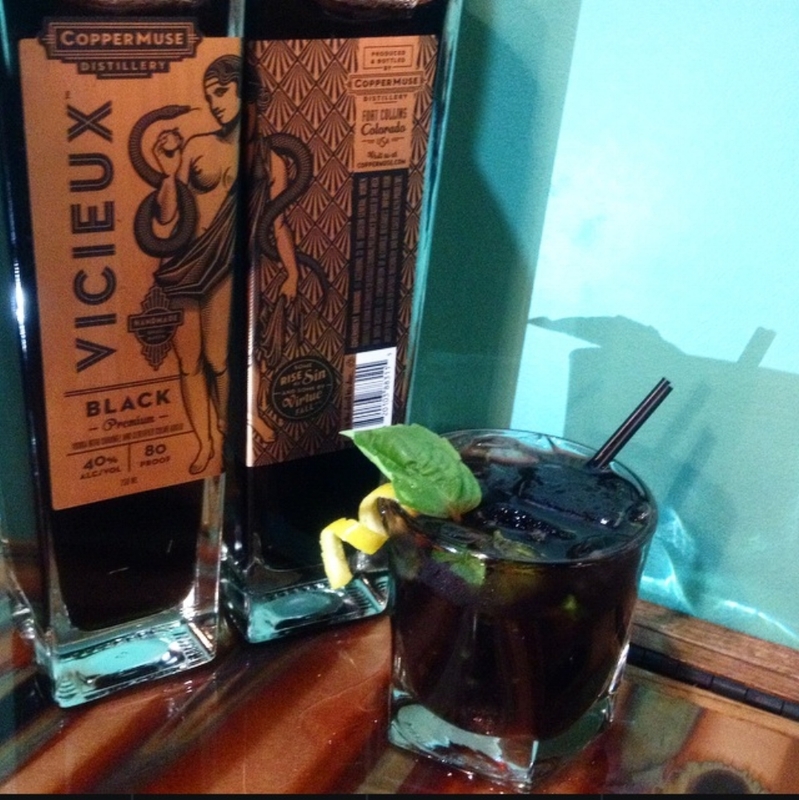 Stop by CopperMuse to try one of these cocktails for yourself, or to buy a bottle or two for mixing drinks at home. There’s always something creative and seasonal to try, and if you’ve never had black vodka before, you’re in for a definite treat. CopperMuse Distillery took home a Silver Medal in the category of Specialty Spirits for their all-natural Amaretto Liqueur. According to the ACSA press release, "Winners were hand-selected among a record-breaking pool of more than 550 entrants – up more than 20 percent over last year." Welcome to the January 2017 edition of the CopperMuse Distillery newsletter. Click here or cut-and-paste the following URL to read all the details. Nice background article written by Jessica Cox for the CSU Source online magazine. Click here or cut and paste the following link. We are honored to be named Best Distillery in Lydia's Style Magazine / 2016 Best Of Issue! Thank you to all who voted. The list of Best Of picks starts on page 29. 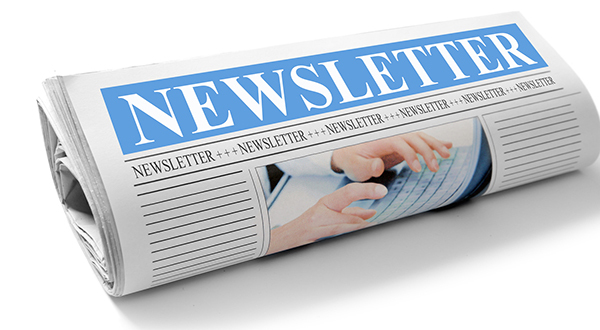 Welcome to the inaugural edition of the CopperMuse Distillery newsletter. Our goal is to keep you informed of our happenings as they pertain to craft distilling / cocktail & culinary arts. We hope to keep your interest and would love to hear any ideas or feedback you may have at info@coppermuse.com. I finally found the link to the news story about the 2014 Breckenridge Craft Spirits Festival, Still on the Hill. CopperMuse was awarded two Gold Medals for our Vertueux Vodka and Gold Rum. Congratulations to all the Craft Distillers for such an awesome event and world-class libations. The spirits were judged in a double-blind taste test by a panel of industry experts: Tom Fischer, host and producer of BourbonBlog; Nancy Fraley, writer and organoleptic analysis expert; and Eric Watson, international beverage consultant. The panel bestowed six gold and 15 silver judgments. The awards were based on the quality of each spirit with regard to taste, smell, integrity and smoothness and not as a ranking of spirits against one another. We are happy to announce that we are finally ready to open our doors beginning this Friday, April 4th from 11am to 10pm. Come sample some of our delicious craft-cocktails and tapas. We’ll also have bottles of our Brightside™ Vodka for sale. Get these while you can as we are only producing 500 of them. Hope to see you soon and share with you our liquid inspirations! I’m happy to report that we’ve jumped through the last remaining hoops keeping us from opening our doors to the public. · Distilled Spirits Plant Permit – check! · Poudre Fire Authority – check! · City of Fort Collins – check! · Larimer County Retail Food Inspection – check! · Distill and produce initial inventory of spirits – check! · Interview and hire an awesome staff – check! · Finalize our food and cocktail menus – check! We plan to open our doors beginning Wednesday, April 2nd provided our final preparations go as planned. We can’t wait to see you there and share with you our passion for hand-crafted spirits, cocktails and food. I never thought that this question would become so difficult to hear. Don’t get me wrong. I am thrilled that so many people are excited for CopperMuse™ to open its doors and be able to sell our inspired libations. Ay, but here’s the rub. The journey to opening a craft distillery is a long one. It is fraught with many ups and downs as one might expect. I personally spend much of my time planning, scheduling, troubleshooting and pushing my Sisyphus-like rock up the hill. What truly makes the question so frustrating is that there are still so many elements outside of my control. A key one being the glacial nature of the Federal government in approving Distilled Spirits Plant (DSP) permits. Before you can even begin to submit an application for a permit, you are required to purchase all your key distilling equipment (stills, fermenters, brew kettles, etc. ), have a property under your business control (own or lease), have a detailed architectural plan of your entire operations, purchase a surety bond to protect the government’s excise taxes on product that doesn’t even exist yet, and compile a lengthy history of financial and personal background information. Then and only then can you submit your application for your DSP. Talk about putting a cart before the horse. Think of all the effort and money that goes into this and you don’t even know if you’ll be graced with a DSP permit at the very end of it. Leap of Faith for sure! The Alcohol and Tobacco Tax and Trade Bureau (TTB for short) rolled out a much improved online permit application system this past year. While this tool is a significant improvement over the past system of literally putting together a binder of information and mailing it off, it doesn’t do squat for the fact that “average” number of days to process a DSP application is running over 110 days and climbing. And this cycle time doesn’t even factor in the lovely government shutdown back in October! I submitted my DSP application on August 12th. That would put my permit acceptance right around the end of November according to "averages". But alas, no permit is in hand. To top things off, you must get label approvals for any products you plan to produce. TTB cycle times for Distilled Spirit labels are currently running 75 days. Yes, 75 days! And you can’t submit any labels for approval until you have your DSP in hand. If you are thinking of creating a unique spirit that strays just a bit from standard spirit types (vodka, rum, gin, brandy, bourbon, etc. ), you better also plan on getting your formulation approval prior to your label approval. Those are running 38 days as we speak. So when am I going to open for business? I really wish I could say for sure. Construction at CopperMuse™ Distillery will be wrapping up just before the Christmas holiday. All I can tell you is that I’m putting in a special request with the big man this year. All I want for Christmas is my DSP. With our new site and blog, we hope to share more of our journey with you in greater detail and keep you informed on our progress! We'll also be sharing and looking forward to hearing from you on Facebook and Twitter.